Space Toad's acting career began in Naarwich, He first acted in a production called 'It is a pity she's a whore' by John Ford. He played the part of a charlatan doctor and after a month of rehearsals, he was thrown in the deep end when the company went to the Edinburgh festival to perform. The play was a great success was reviewed favourably in the local press. Often, after the play Paulo would play his music in the festival club.The club for the actors. His next acting appearance was as the narrator in Brect's 'Threepenny opera' in which he sang 'Mac the knife'. This performance took place in the Maddermarket Theatre in Norwich and was also a success. 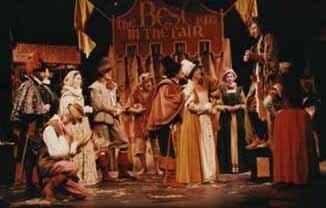 Later that year, in the same theatre, he played the part of the minstrel (a part which came very easily to him!!) in Ben Johnson's 'Bartholomew Fair'. 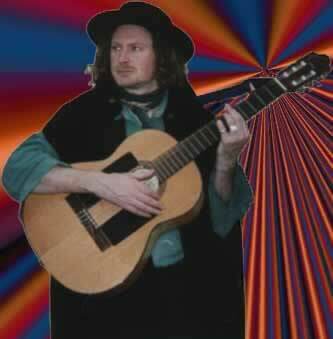 In this play, he also played the mandolin and composed the music. The theatre took a back seat for the next few years, until he wrote his own first complete play, 'The Thwarted Tangentialist From The End Of Time'. Martin The Director of the Nightingale Theatre in Brighton, heard some of Space Toads's play and asked him to stage it as part of the Brighton Festival, it played for the first time ever at the Nightingale. The audience(which included Brian Behan,brother of famous Irish writer Brendan Behan amongst others) reaction, was a strange mixture of laughter and bemusement. It was described as iconaclastic, surrealistic and one person later said, that it had a catalystic effect on his life. The play was in the genre of 'The Theatre of The Absurd'. It was a two man play with a female narrator with slight overtones of Samuel Beckett. This a photograph taken in rehearsal for 'The Thwarted Tangentialist'. Once again,Paulo took a break from theatre until he was in the middle of his degree in music and related arts. Whilst on this course, He wrote his second play, 'Le Marriage de Roi Bizarre'. He showed the finished play to the head of Literature who thought it was fantastic and said "Apolinaire would have bean jelouse!" and pointed out the strong connection with other writers of the theatre of the absurd. This was strange, as up to this point, Paul had only been familiar with the work of one of these writers, Samuel Beckett. Paulo decided to study the theatre of the absurd for his dissertation and discovered he had a great affinity with writers such as Eugene Ianesco, Alfred Jarry and Fernando Arabel amongst others. He staged a shortened version of the play in the University and there was a fantastic audience reaction with people falling about laughing. Unfortunately the video of this play has mysteriously 'disappeared'. However he hopes to put both of his plays on again in the future. 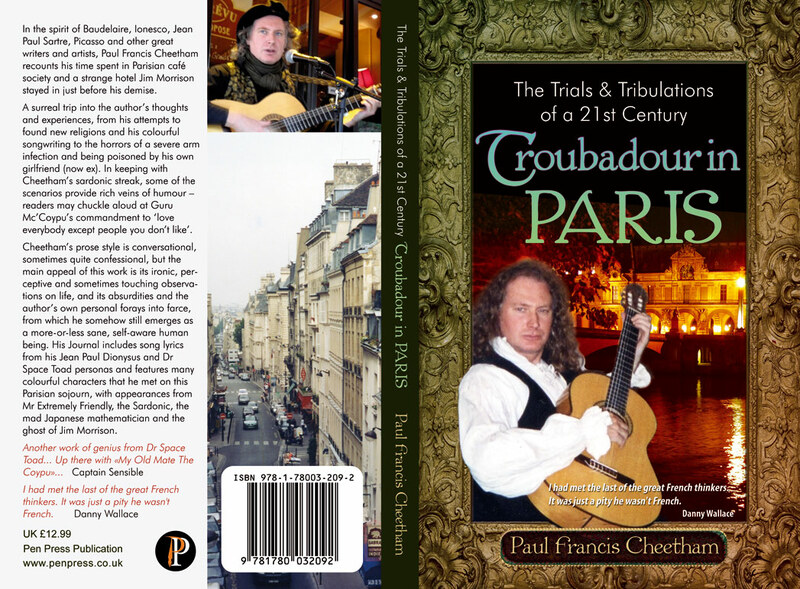 He has now also transalted them into French.The french and English versions are now available on Amzon , see Theatre pag in www.paulfrancistroubadourspacetoad.com He is now working on the Spanish translation. Soon after he had finished his degree, Space Toad was asked to play the music for a Garcia Lorca play: 'Blood Wedding' in the Brighton Festival. This was by the Prodigal Theatre Company and they called their version 'Ballad of the Shadow'. This play was staged in the Brighton Buddist Centre and everbody congratulated The Toad on the musical pieces he chose and wrote for the play. It is hoped that there will be another staging of this play in the future. One year later he (again with the Prodigal Theatre Company) played the role of King Claudius in a version of William Shakespear's Hamlet "The play within the play".It took place in the grounds of Lewis Castle and was very well recieved . Below is Paulo's Book available from: ,Waterstones, Amazon or directly from Paulo for a signed copy by the author. 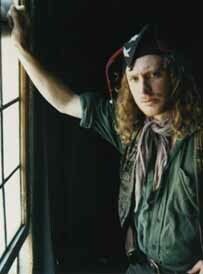 Here is a photo of him playing the part of a prisoner in a Victor Hugo story called Claud Geux on French TV. Can you spot him amongst the others? .